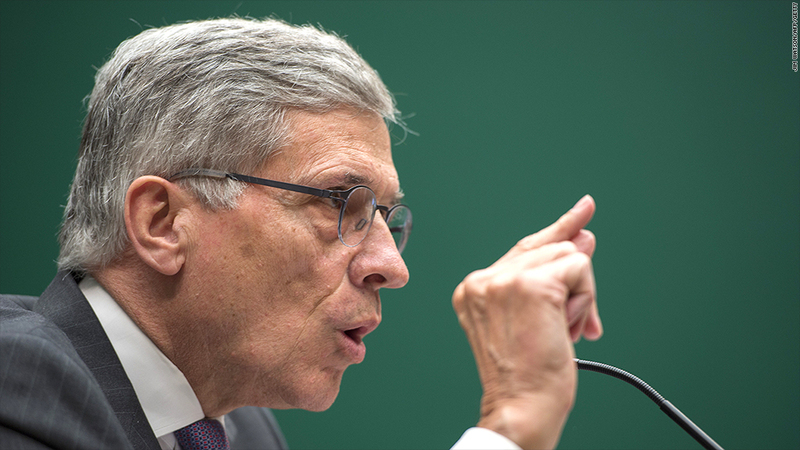 FCC chairman Tom Wheeler's got some harsh words for Verizon. Federal Communications Commission chairman Tom Wheeler sent a letter to Verizon (VZ) questioning its plan announced last week to slow down 4G connection speeds for certain customers with unlimited data plans. The news was first reported by Mashable, which posted a copy of the letter online. Wheeler didn't mince words in his criticism of the wireless giant, saying he was "deeply troubled" by the initiative. Verizon no longer offers unlimited data plans to new customers. But subscribers who signed up for unlimited plans before Verizon ditched them in 2012 can keep those plans -- provided they pay full price when they get a new phone. The company said last week that it would occasionally slow the connection speeds of those customers during times of heavy network usage if they fall within the top 5% of data users. The telecom giant said it would throttle speeds to help manage its network. But Wheeler rejected "network management" as a justification for slowing connections of paying customers. He called Verizon's actions "disturbing," suggesting that the company was trying to force people into usage-based plans, in which customers pay per gigabyte. "'Reasonable network management' concerns the technical management of your network; it is not a loophole designed to enhance your revenue streams," he wrote. "I know of no past commission statement that would treat as 'reasonable network management' a decision to slow traffic to a user who has paid, after all, for 'unlimited' service.'" Verizon said Thursday that it would send an official response to Wheeler once it had "received and reviewed" the letter. "[W]hat we announced last week was a highly targeted and very limited network optimization effort, only targeting cell sites experiencing high demand," the company said in a statement. "The purpose is to ensure there is capacity for everyone in those limited circumstances, and that high users don't limit capacity for others." Verizon says unlimited data users will only experience slower speeds while performing high-bandwidth activities like online gaming or streaming video. The FCC is currently in the process of finalizing new regulations on "net neutrality," or how broadband Internet providers can treat traffic on their networks. Those rules won't apply to the wireless services, however, which are more lightly regulated. From a regulatory perspective, mobile connections differ from broadband in part because wireless spectrum -- the collection of frequencies over which all wireless transmissions travel -- is a finite resource. That means managing traffic can be more challenging for carriers. The FCC auctions off spectrum rights to private companies, and Wheeler said Verizon's new policy could violate the terms of ownership for the high-speed spectrum it currently holds.